First, send us your design documents. While we can develop 3D renderings from a rough floor plan sketch, we prefer to work from professional blueprints, (either .PDF or .DWG file format are OK.) Include drawings of all floor levels, front-sides-back elevation drawings, and roof plan. Include electrical plan if you want light fixtures shown in renderings. You may also send photos of interiors and exteriors that show your preferred design and decor style. We will use these photos as general inspiration when we build and decorate your 3D project. If you need your renderings to contain your exact choice of appliances, light fixtures, plumbing fixtures, furniture, tile, brick, stone, paint, wall paper, etc, you must send specific details so that we can replicate these products. We must virtually build your specific items in 3D before we can install them into your home's 3D model. Send photos, brand, model numbers, size, and color. NOTE: Replicating your choice of products adds complexity and will likely add to cost. Allowing us to install our choice of products avoids this added cost. If you are building your dream home, you are probably most interested in understanding the flow and feel of the home's design. You want to see ALL of your home inside and out. In this scenario clients generally choose less photo real renderings, but many of them. 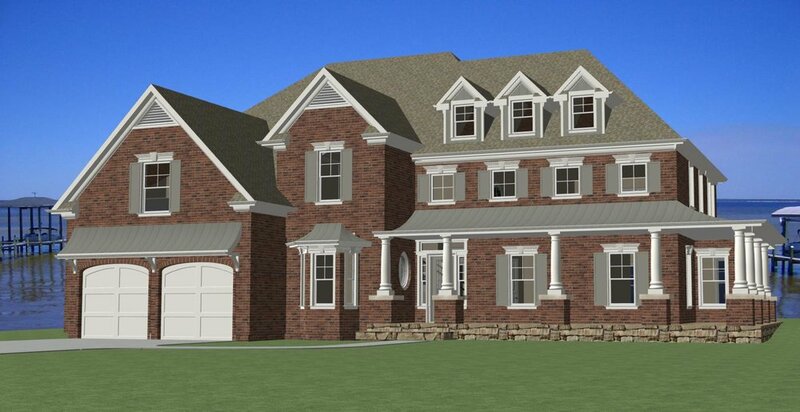 3DPlanView calls these "draft rendering" projects. If you are a builder, developer, architect, or real estate agent, you probably want to market your project online or in print. In this scenario clients generally choose one or more highly photo-real 3D images commonly used for marketing real estate. 3DPlanView calls these highly photo-real 3D images "production renderings." NOTE: Building a 3D virtual model and creating draft renderings are a part of every 3D rendering project. If you order a production rendering, you will also be given draft renderings as previews. After reviewing your specified requirements and your blueprint or home concept drawing, we will send you quote. If you decide to go forward, half of the price will be due before work can begin on the project. 3d renderings can include YOUR PROPERTY's actual window views! the blueprint is followed EXACTLY to create a digital 3D model OF YOUR HOME. We construct a three dimensional virtual structure based on your blueprint. This is more than a picture; everything must be built. Just like in the real world, you can't take a picture of a house that isn't there. We build all areas you requested to see at the time of the quote. This may be just one room or the entire home inside and out. All the blueprint's structural details are followed to exact size and shape. We incorporate any design request regarding decor, design, or blueprint changes that were submitted by you and included in the original quote. Once the virtual structure is built, we'll create draft renderings and walk-through videos. All of your 3D draft renderings and videos will be uploaded to your projects Dropbox folder. We can also schedule an online meeting where you will be able to see your 3D virtual model on your computer screen, real time. You can tell us which way to turn the camera and where you would like to "walk." You will be able to SEE your blueprint in 3D, exactly as it was drawn. Are all areas of the home as they should be? Are their areas of the home you would like to change? After seeing your home's virtual model and 3D renderings, you may want to make changes beyond the scope of the original quote. 3DPlanView will work up a bid and estimated delivery date for the completion of the 3D model's changes and new renderings. Generally we can produce side by side comparison renderings so that you can see which version of your house you like best. Changes will be bid and billed as they occur. Individuals building their dream homes often stop at this point. After seeing the draft quality renderings and making a few modifications, clients KNOW what their home will look like when it is actually built and KNOW they love their home's design. say about their 3D rendering projects. First, we will send sample camera views for you to preview and approve. You may choose any number of camera positions for your production renderings. Small rooms can usually be clearly seen with just one or two renderings. Very large open spaces may need as many as four or five. Next we export your entire virtual 3D model into our professional rendering software. We use Maxwell Render. The 3D model's contents and textures must be edited and tweaked to make them production render ready. Once each camera view is "baked," we'll send you a water marked version for preview. When you are happy with the results, the invoice is paid, and the non water marked rendering is uploaded to your project's Dropbox folder. The client's blueprint was converted to a digital model. 3d appliances, COUNTERS, and cabinets were installed PER CLIENT'S SPECIFICATIONS. renderings were POSTED ON MLS AND REAL ESTATE WEBSITES to pre-sell condo units long before the construction was completed.